Graflex.org :: View topic - Proposal: Graflex Filter Research Project! Proposal: Graflex Filter Research Project! I've been scouring all the great info on this site for several weeks, ever since I was offered a Crown Graphic from my dad the antiques dealer. Thanks to this site, I was able to say yes and know that I would have access to the info to get things working. It has been a real blast learning about these cameras, I am really hooked! As a thank you, I'd like to make a contribution to the body of information on accessories - namely filters. The Speed Graphic FAQ says use the Series VI Filter Kit, but what does that mean to a newbie? Which size adapter ring fits your lens? Which lenses take which series of filter? but how to get everyone to cough up their filter/adapter info? Any suggestions /comments would be appreciated. Thanks for considering! There is a chapter about filters etc in the book "Graphic and Graflex Photography". I have a very nice Wollensak "Sunshade & Filter Adapter" For my 135 Optars. It takes Series VI filters. The lens ring is 1 1/2". Also have a Kodak adapter which is marked 1 1/2" and 38mm. Some of this info for the Optar lenses has already been compiled on the board: see http://www.oresteen.com/optar_lens.htm . Also use the Search feature on the board; enter "filter sizes" to get a long list of relevant threads. Thanks for referring me to the Optar chart - the format of that chart data is just perfect! I will search as advised on filter size and see what else I can find, and how much other info can be collected in one easy-to-find place. tbob38, thanks for sharing your lens data - it's much appreciated! Welcome to the wild world of Graflex. I have a owned my Speed Graphic now for over a year and I am also completely hooked by the Graflex bug. I have a copy of Graphic Graflex Photography (1940) with some lens information including filter sizes for popular lenses for Graflex. Also I have some Kodak Lens guides from the 1950's which has filter information for Ektar lenses. I have spent the last few weeks scanning them, if you want I can send you the scans with the filter information. Send me an email and I can send you those files. Take care and have fun with your camera. Thanks for the chart, Rich! Is it from a Graflex source? It's interesting as much for what it omits as what it includes. For example, no listings for the 65mm Optar or the 101mm Optar lenses! And I can't tell whether that 101 listed is "Graflar" or "Graftar," but my Graftar takes a 31.5mm slip-ring (same as the 101 Optar). So far I'm pulling together some good stuff, including relevant info from Graphic Graflex Photography, which shows which Series is needed for which size lens diameter. Ansel Adams' the negative also has some info worth including. Henry, once all this great info is collected, how do I go about submitting it to Graflex.org? Many thanks to all for your support, and please continue to share all this great stuff! FYI, the 65mm Optar takes a 33mm slip-ring (although I had to enlarge that slightly with the Dremel tool for a good fit), and the 101 Optar takes a 31.5mm slip-ring. Is there any info on filters for the Cooke Kodak 6-inch f4.5 lens found on the Graflex series B camera? Does anyone even know if the thread inside the front of the lens is metric or imperial? Sorry, I don't hvae any information on this one, but how about calling Pacific Rim Camera? There's a strong possibility they can help. It's interesting (curious?) 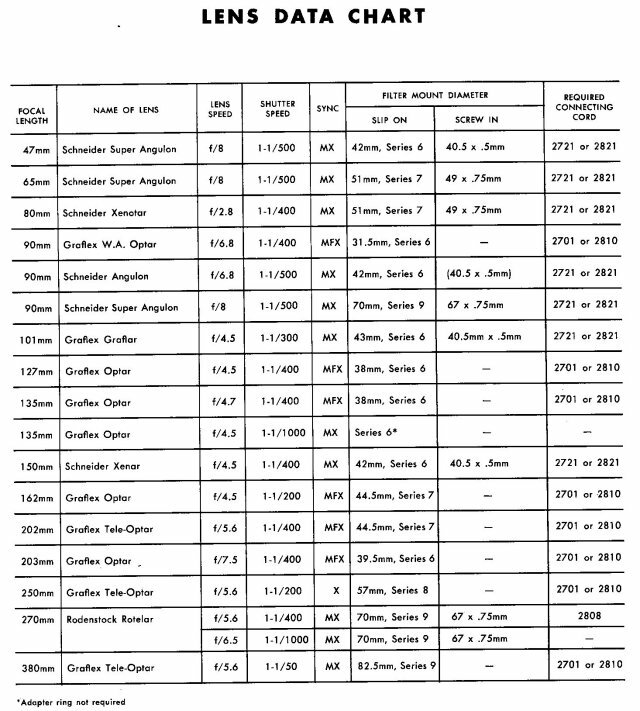 that the chart, though presumably a Graflex document, lists neither the 65 nor the 105 Optars! The 65 takes a 33 mm slip-ring, though mine would not fit without modification, and the 105 of course takes the ever-popular 31.5 mm slip-ring. use the Series VI Filter Kit, but what does that mean to a newbie? If no Adapter Ring listed provides an exact fit, select the next larger listed size (within 1/32-inch). Graflex Super D 3-1/4x4-1/4 with the 152mm f4.5 Ektar takes a Series VII 1-11/16 inch adapter.